As usual, the birds have the best idea. 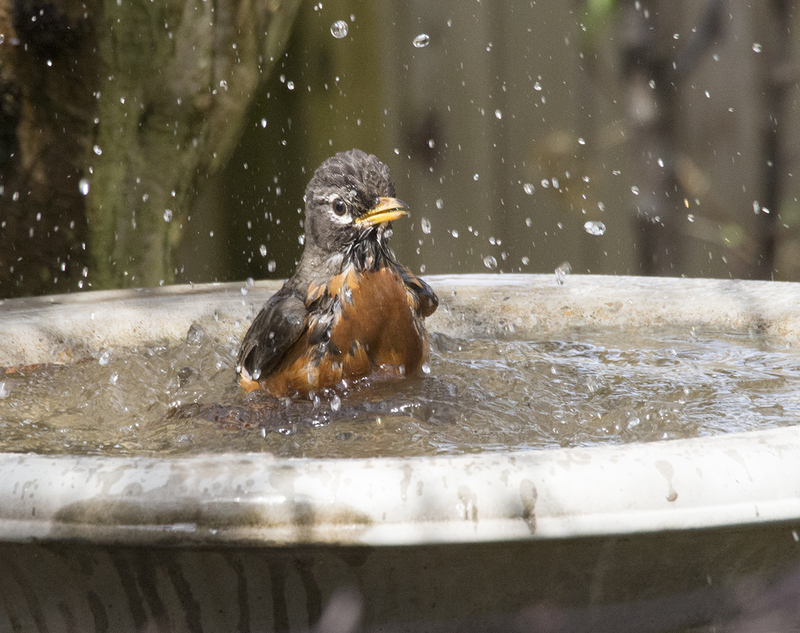 When the temperature soars, head for the water. 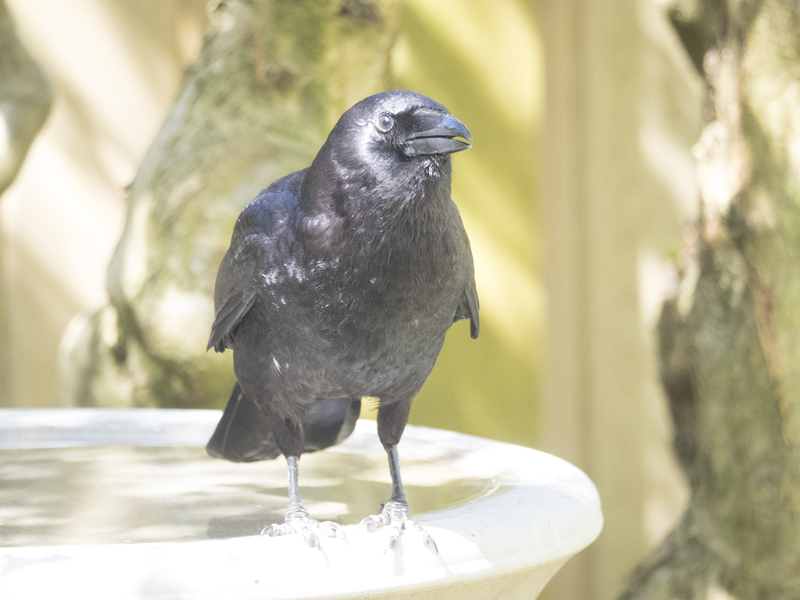 When it’s really hot, I love to watch the birds having fun with water in the garden – in the birdbath, the sprinkler and now in my new “mister”, purchased this week. Note: the mister is also great for spraying on yourself! 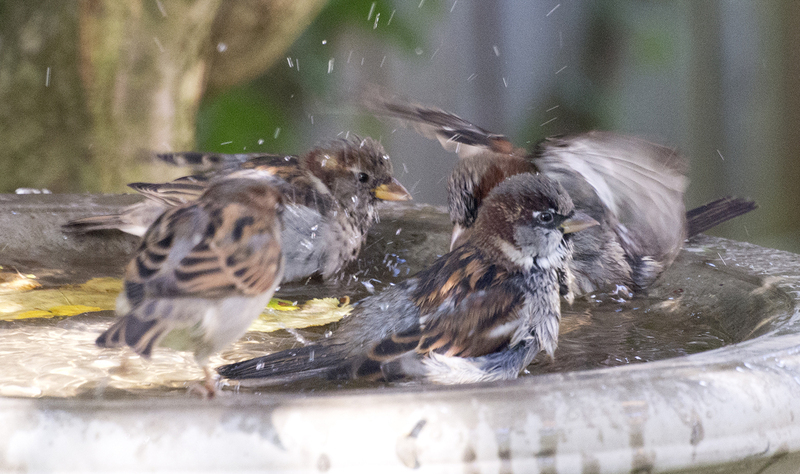 Here’s a selection of some of the visitors to the garden “water park”. And sometimes you just can’t get the place to yourself. Sigh. Best to get your feet wet first before plunging right in. 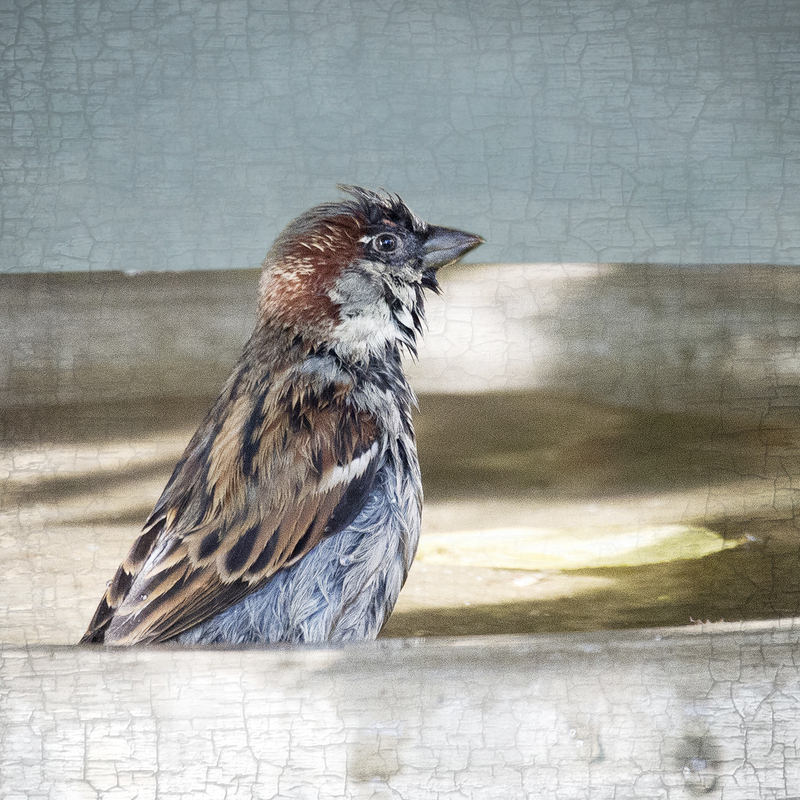 Singing at bath time is traditional! 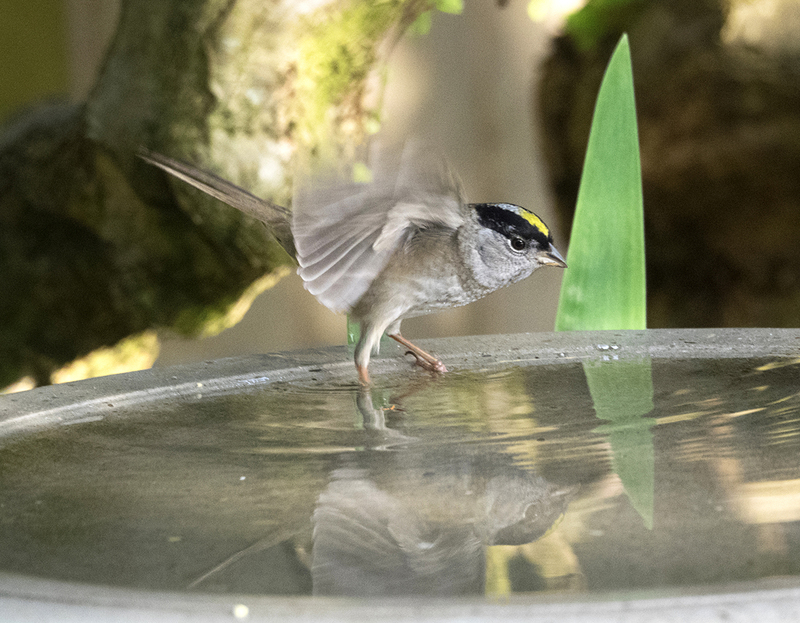 This little golden crowned sparrow had a sticky bit of rhododendron bud stuck to his foot, so he hopped in the birdbath to rinse it off. 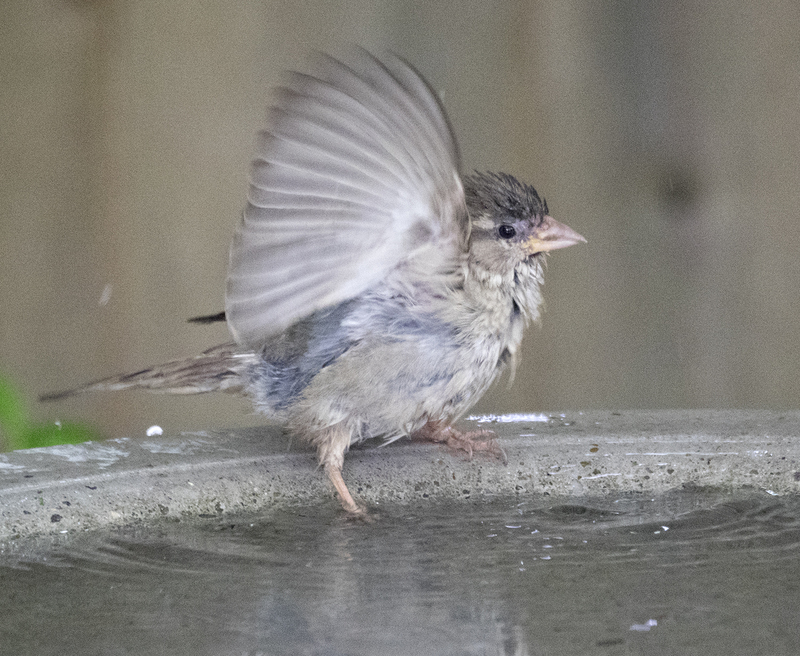 The birdbath gets some very elegant visitors. … and some very handsome visitors! 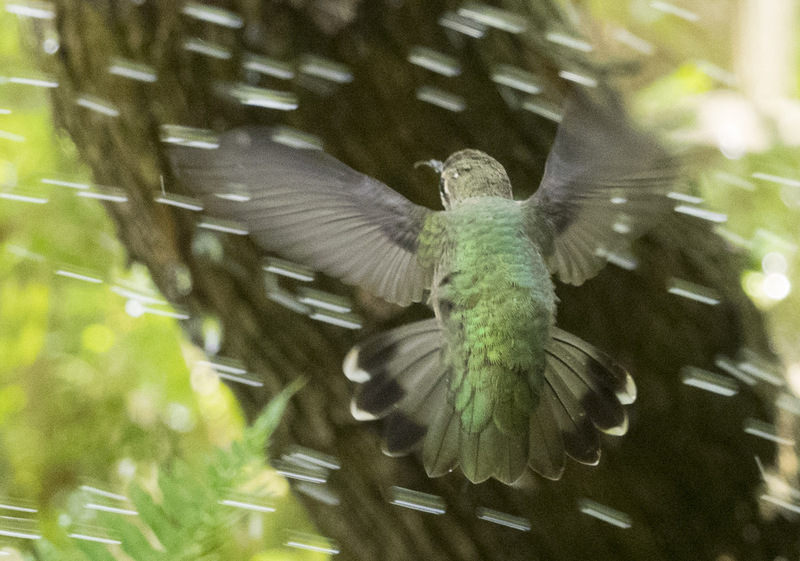 … and some very splashy visitors! 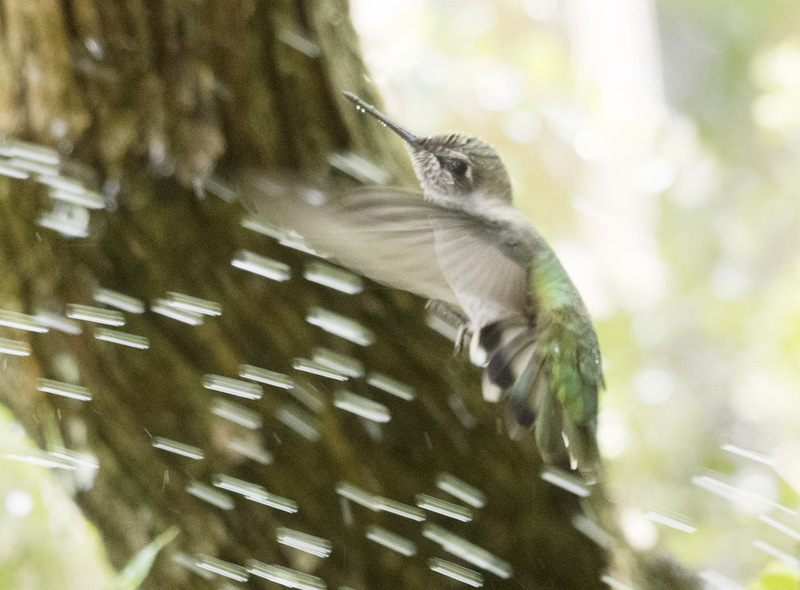 And some visitors prefer the lawn sprinkler! May everyone stay cool and happy this weekend. 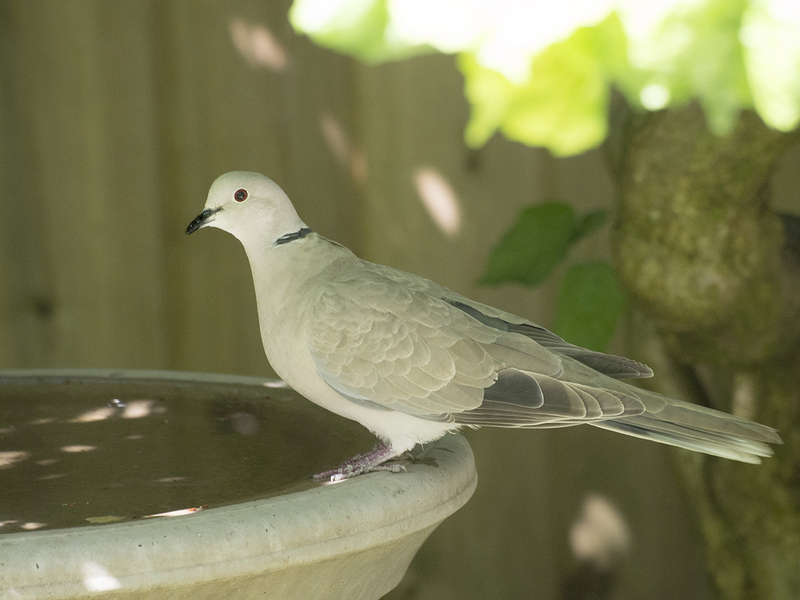 And remember to put some water out for the birds if it’s hot and dry where you are. 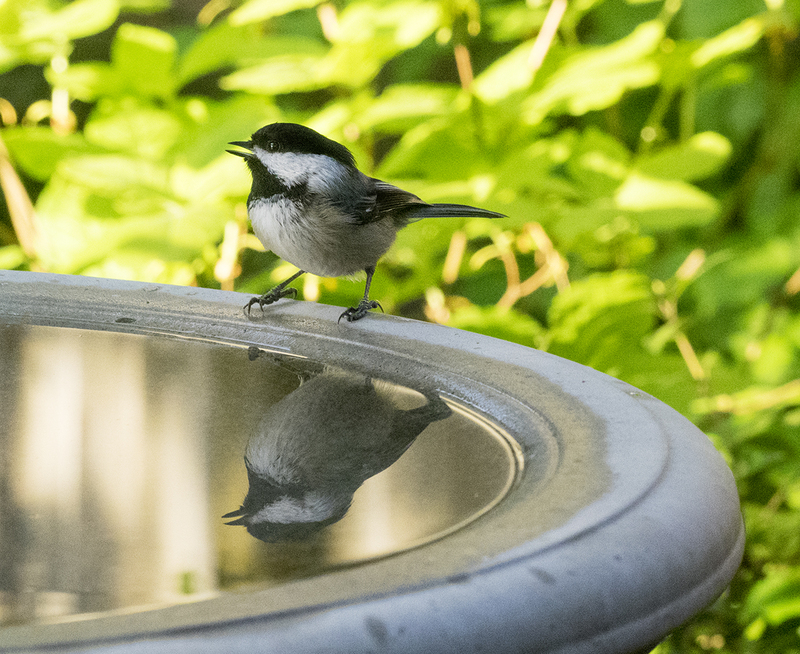 If you don’t have a birdbath, a plastic plant pot tray with some water in it will do. Just change the water daily. 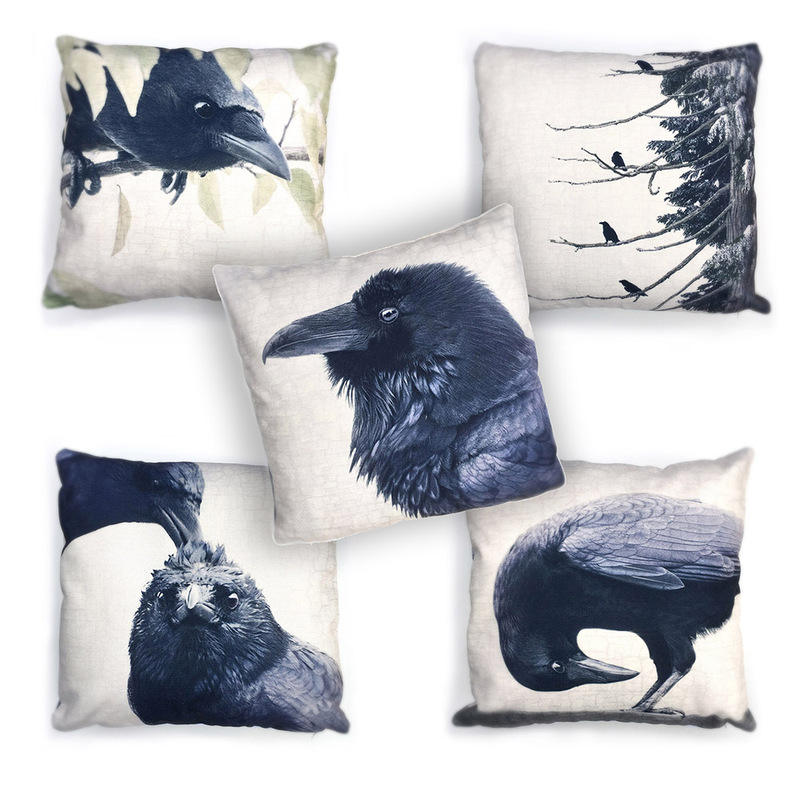 To see my collection of bird prints, visit my web site. Crows enjoying the pools near the Royal Museum in Victoria. It was a very social and happy affair that went on for hours. 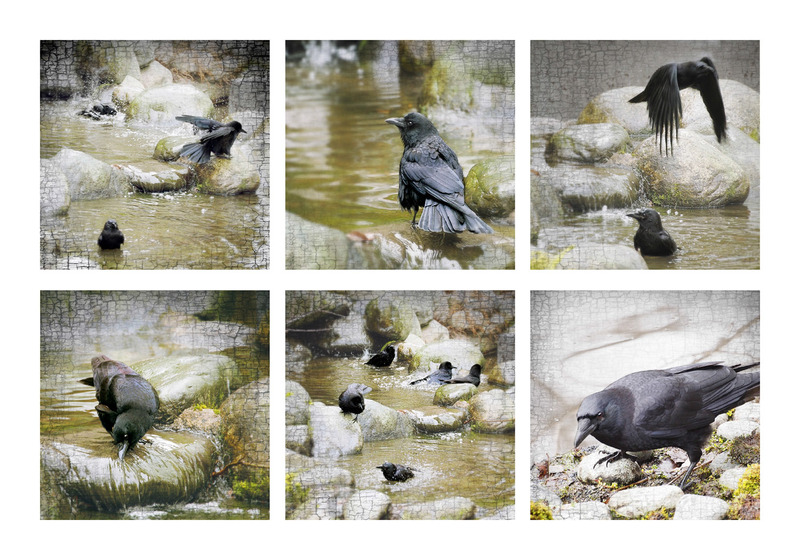 Fantastic photographs of all the birds in the water. Well done June! It is indeed a pleasure to take in all nature has to offer.